Josef Newgarden checked off another milestone-win in the NTT INDYCAR Series season opening race. The 2017 NTT INDYCAR Series champion led three times for a total of 60 of the 110-lap race on the way to his 11th career victory. The victory was the sixth win by a Chevrolet 2.2 liter V6 powered driver on the intricate street course since 2012. “Josef Newgarden’s win today on the Streets of St. Petersburg is the culmination of a focused effort during the off-season by the Chevrolet engineers along with our technical partners and all of our partner IndyCar teams to enhance our performance on street circuits. It is a great way to start the season for Chevrolet,” said Mark Kent, Director of Motorsports Competition. “Congratulations to Josef, Roger Penske and everyone on the No. 2 Hitachi Chevrolet team for scoring this win. The level of competition in the IndyCar Series is exceptional, so to get a victory in the season-opening race is a significant achievement,” added Kent. Pole winner, Will Power, No. 12 Verizon Team Penske Chevrolet, finished third to give Chevy two podium finishers. Simon Pagenaud, No. 22 Menards Team Penske Chevrolet, finished seventh to complete the Bowtie finishers in the top-10. Scott Dixon (Honda) finished second. Race two of the 2019 17-race NTT IndyCar Series season is set for March 24, 2019 at Circuit of The Americas, Austin, Texas. Josef, I think yesterday we heard you say it was an OK start to the weekend, a medium start to the weekend. How are you feeling now that you’ve come out victorious here on the streets of St. Pete. JOSEF NEWGARDEN: Yeah, it’s a great finish. I’m so pumped that we were able to execute today. I was really bummed yesterday. I thought we had a good qualifying position and it was a great team effort being 1-2, but I thought we had pole speed, and I didn’t fully execute on that qualifying lap. So I feel like we executed today. We were very patient in the beginning of the race. We had a right-to-left different tire strategy again today, and it really paid off. I actually think it’s what helped us create the opportunity and we just waited for that, and once it was there, we switched it up, we went to red, probably one of the only cars on Reds at that point and they were new and it really panned out. I’m so proud of the team. The engine was great. Team Chevy did a great job this week, had everything we needed. Everything was really solid. We found our footing yesterday and finished it off right today. JOSEF NEWGARDEN: Well, we are perfectionists. Certainly, if you drive for Team Penske and you’ve been in the series for a while, you’re not really — and you have a winning car or a pole car, you’re not satisfied with anything but that. You know, it’s not that it was the end of the world, but you want to be able to get the most out of the car and yourself in any given day, and if you fall short of that even just slightly, it’s disappointing. So today I think we got everything we needed to out of today. We were just fractionally short yesterday. But it does speak to the series. The series is so close and so tight that, you know, it is hard to get it all perfect, it really, really is. Everyone is too good now. There’s not a lot of cars that aren’t solid. When you’re a driver and you come to the series, most teams are very with it, very accomplished, and they have great equipment, and all the drivers are pretty stout, as well. It’s tough. It’s very difficult to put it all together but like I said, if you have the team and you have the experience, then you feel like you have to put it together, and that’s where the disappointment sometimes comes in. JOSEF NEWGARDEN: It just seems like it gets tighter every year. You’re looking at the time sheet to start off and it seems like it’s getting tighter, and you can’t fathom that. You feel like you’re going to run out of room at some point but we are just on top of each other. You don’t see — I don’t think you see a lot of people that are miles off the pace. Just no one is. We are all within that half-second, three-quarters-of-a-second window and when you get that, you can’t slip up. Half-a-tenth makes a crazy big difference and so you’re fighting for all these little details, and yeah, that’s how it was last year. But it just seems even a little closer this year. Hopefully, that means great competition. You’re not going to see anyone really drive away. I think you’re going to see a lot of different winners again this year and I think you’re going to see mixed up fields every now and then and that’s a good thing. I think you want that. I don’t think you want anyone dominating for sure. Hopefully, we can do that but I don’t think that’s going to be the case with the competition level. THE MODERATOR: We saw a rookie driver like Felix Rosenqvist had a great day today but does it seem like forever ago that was you people were talking about in terms of here is a great new guy and he’s having strong performances. You’re a series veteran. Is that strange? Is that interesting? JOSEF NEWGARDEN: I feel like I’ve been a veteran for years now. I remember people kept telling me, oh, you’re like a new star of IndyCar and I kept getting it every year. Now I’m like eight years deep into it and I think it’s been like that for a little while. So I don’t feel like a veteran — I felt like a veteran three, four years ago, so you get better for sure. I think drivers tend to linger on in this series longer because experience is so valuable. You know, that’s why guys like Scott are so good and guys like Helio were so good and still are at a place like Indianapolis. I mean, experience really does pay in a series that’s this diverse and this detail oriented. You really have to be on top of every little nuance. The more years you go through that, the better you get at that process and it’s certainly helped me and I try to be better every year but it’s great to see guys like Felix — to get to your question. He’s going to be a very strong competitor. Different background to me when I came into the series but very difficult to beat this year, he’s going to give Scott a run for his money and he’s going to give all of us a run for our money. We want to see the greatest talent in the world running with us and I think you have one of the best in him. Yeah, it’s going to be tough to beat him. Q. At the end of the race, it looked like Scott (Dixon) was able to close the gap on you. Were you able to conserve the car at that point? Where we ripped a big one was just on Red tires, and when we went out on brand new Reds we were able to open up a huge chunk and it was just really good timing and positioning and once we established that gap, it was about managing it, really. We didn’t have to blow it wide open and we didn’t need to see it shrink too quickly but we let it seesaw back and forth how it needed to. Where it was tough was really the traffic. I don’t know what we should do with the blue flag rule. We’ve had this rule that we introduced three or four years ago, whenever it was, and the drivers asked for it. We asked for this rule to be there. But it’s tough, when you come up on traffic, you legitimately have to work your way through them and they are working push-to-pass to stay in front of you, and so you’re like trying to pass an actual competitor on the racetrack. It’s not a lap car. So that made it really tough today. JOSEF NEWGARDEN: I thought he was just about right. He wasn’t overzealous, but he’s a very experienced driver. He’s a rookie, but he’s driven just about anything you can drive outside of an IndyCar. He’s very, very good, very, very talented and I’ve watched him in all forms of racing whether it’s DTM or Formula E, anything. Even Indy Lights when he was over here doing a little bit of that, and he’s very, very good at managing his car. I thought he was just perfect. Wasn’t too aggressive and he wasn’t too timid. For me, I didn’t have a great start and I wheel-spinned really bad off the line, pulled the gap — that’s how Felix got me, and then it was all about keeping Scott behind and I raced Scott through turn one and I didn’t want him to get me either. After that happened, it was really about being patient. He was quick and he was just the right amount of aggressiveness in the beginning and that’s what got him to the lead and what got him leading laps. But I knew we had the car to win and so I was just waiting for our opportunities. I knew within cycles and tires, we were going to have an opportunity present itself, so I just kind of stalked those guys and waited for it and once it was there, we pounced. 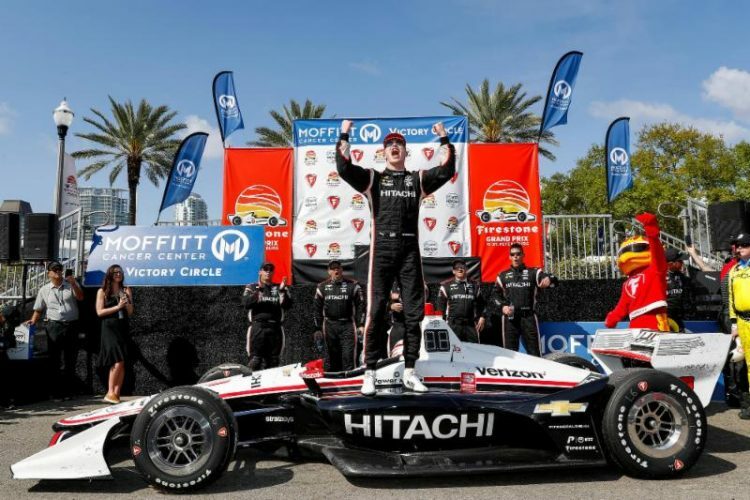 JOSEF NEWGARDEN: It’s been a good start for Penske. Q. Four wins in three series in a week or two. What’s it like to be a part of that. JOSEF NEWGARDEN: It’s great on one hand but it also — I mean, it adds a level of intensity, you know, because you see everyone else in the organization. They are all doing well. You don’t want to be the one group that’s not doing well. At the same time, if we weren’t doing well, it wouldn’t be the end of the world. That’s going to happen. We’re going to yo-yo up and down from a performance standpoint within our organization, but you don’t want to be that one group that’s falling behind. So far we’ve started off well. Yeah, they are stout, man. It’s across the board. Whatever Penske puts their efforts in, they are going to make the most of it. They have a strong hold on NASCAR it looks like at the minute with this package and they are doing a great job. The Supercars, they have been stout the last couple years with our drivers over there and INDYCAR, we’ve teetered back and forth and this year I’m hoping we can have something closer to 2017 when we won the championship and I think we have a good start to that. JOSEF NEWGARDEN: Well, I’ve always hated my results here the last seven years. Just never had — I have honestly never had a good race here in an Indy car. The first year I came here in Indy Lights I won the race and it was awesome. I love this place and I continued to love it. I just hated the results that we’ve had the last seven years. But the event itself has always been so captivating I think to me and to the series and to this town. You know, really, from everything I’ve heard, everyone supports it incredibly and love it when we come to town here. There’s truly an energy and a buzz about it. It’s not the biggest city we go to, and they really light it up for this weekend when we show up. I love it. It’s one of my favorite event to come to. It’s just cool when you leave the track every day. You show up Thursday or Wednesday, every night you go back to the hotel, you walk the sheets and your hotel is normally close to everything so you can walk downtown and hang out, relax. It’s kind of like having a vacation on a race weekend, it really is. I’ve always enjoyed this atmosphere. JOSEF NEWGARDEN: That would be cool. You nailed everything — but you’re 0-for-1 right now. JOSEF NEWGARDEN: By the way. So we’ll see how this year pans out. When we assessed last year, I thought we were so good everywhere we went for the most part. We had great qualifying performances. We weren’t lacking qualifying speed. It’s just race day bit us way too often. We just — we were either feast or famine last year, it was win or nothing pretty much, or it was Top-10s but for us, that’s not good enough. You’ve got to be on the podiums when you’re not winning the race. Coming back this year we felt similar as far as our energy level and commitment and today was a great execution day. I just, one thing that’s got to be better this year is we’ve got to be able to — if we’re not winning the race, we have to consistently be in the Top-3, Top-5. If we do that we’re going to be there just like last year and have an even better shot of winning the championship again. Q. I know it the first race and doesn’t necessarily mean that Felix is going to be like this every weekend but with his pedigree, he very well could be. With another serious challenger on a series that’s already pretty deep, is that something you welcome or does it make your job more difficult, one more guy that you have to fend off? JOSEF NEWGARDEN: I don’t think it changes anything. It’s kind of the status quo at this point. We always get new blood in that’s strong and talented, and Felix is everything about that. So I think it’s cool. He’s going to certainly raise CGR’s game I think. He’s going to push Scott. We kind of already saw that this weekend in my opinion. He’s going to really make him work harder. So what’s that going to do to their dynamic, that’s what I kind of think about. But without a doubt, he’s going to be strong and we always welcome that. I think you need the best — I’ve always said you need the best of the best from around the world. That’s always what’s most important. You want to have strong Americans, but you need the best to compete against us, and he’s without a doubt one of those people. He’s world class. Yeah, he was good today. He got some help in qualifying, which everyone knows which helped him start higher, but even without that, he’s going to have very strong weekends this year and he’s going to be a threat. JOSEF NEWGARDEN: I don’t know if I think about it like that but we’re real greedy people, race car drivers. You just want to win everything. All I think about is just winning more races and championships, and hopefully some 500s. That’s all you want to do. There’s not too many that you can win, so I don’t really think about the effects that it has, if you start doing that, but yeah, another championship would be great because everyone talks about, it’s so much harder to follow it up and win a second championship and so on, so I would really love to be able to string that together this year and climb that next mountain. It’s as simple as when you climb that mountain, you look at the next one and try to keep going. Q. I know you were at the Predators game. You didn’t mix it up there? JOSEF NEWGARDEN: I need to start coming up with some stories or something, you know, like, yeah, I got in the rink with Roman Josi and I checked him and he got pissed and checked me back and knocked my tooth out or something. He’s a Predators’ player for people who don’t know that in the NHL. I can give you the breakdown if you want. It’s awkward to explain. I have reverse braces going on right now. I had braces when I was a kid and I have a tooth missing and they basically pulled everything over and didn’t replace that tooth and it’s given me jaw problems for the last five years. I’ve just gotten to the point where I can’t deal with it anymore. So now I’m like redoing this whole process from my childhood to like open it back up and put a tooth where it was supposed to be. So it’s kind of awkward to go through but I have to do it. What was happening the last three years is I’d be in a race car, and I’d get out and like I couldn’t open my jaw and I couldn’t eat for like 24 hours. It would just keep happening to me. So essentially what’s going on is I’m trying to fix my jaw and that’s what you guys are seeing. And I also am from Tennessee. I don’t know if anyone knows that (Laughter). I’m really trying to build my brand as a Nashville guy. Bit of a cowboy, rugged, and I think this adds to it. So appreciate you asking. A guitar, boots and some tooth missing. JOSEF NEWGARDEN: Everyone seemed quite timid on the Reds today. Everyone started on Reds like they were just gun shy about what was going to happen with them. You know, whether it was they were going to go off or they just didn’t think they were good on the Reds. That’s why at the beginning of the race I was just patient. I knew we had something up our sleeve there and that was really our strategy. What you saw us do today was our strategy going into it. I tend to think everyone was really scared of them today, that they didn’t think they would be as strong on the red compound but we felt very good on them. I thought it was a very good decision. JOSEF NEWGARDEN: Well, yeah, OK. That’s a great question. This could get very political. I’ll give you my opinion. I like the purity of INDYCAR. I think we try to keep things as old school as possible without it being too old school. But for sure, I think with Kyle Novak as our race director, he’s a fan of not throwing cautions if they don’t need to be out there. If you need a caution, there’s a safety issue, we’re going to throw it for the most part. I think they do a pretty good job of trying to balance that, and that’s what you saw today. I think they tried to balance when they needed a caution, they threw it and when they didn’t, they tried to leave it green. That’s kind of been our goal with Indy car racing that we don’t need to add fluff to make the show better or more interesting. I think that’s why people like the NTT IndyCar Series. That’s not knocking on any other series. I’m just talking about the pedigree of Indy car racing and I think it really fits the history of the sport and that’s our bag, man. That’s why we do it. I’m happy with the series. I think they do a nice job of trying to balance. It you’re not going to be perfect but I think they do a good job of trying to be as good as they can about it. THE MODERATOR: We will get started with the NTT IndyCar Series post-race press conference for the Firestone Grand Prix of St. Petersburg, joined by our third-place finisher, Will Power. Will Power, driving the #12 Verizon Team Penske Chevrolet finishing third in today’s race, his fifth podium here on the streets of St. Pete. I think Roger did a real eight call hoping it would go yellow but didn’t. We still were in the game. I felt we were quicker than Rosenqvist, and we could have pulled a big gap, which would have covered for the called tie penalty, but unfortunately, I lost that position and I was stuck there. WILL POWER: Yeah, he did a great job all weekend to qualify the way he did and to race the way he did, very strong in the race, good as you would expect. I couldn’t see anything — he’s a rookie, but he’s obviously going to be really strong and has done a good job. WILL POWER: It’s the driver on track that has the right of way, so unless the guy coming out of the pits is going to clear him, which both times actually it was so close with Scott and Felix, yeah, I expected them to back out because that’s — that was a rule but was keeping one eye right there just in case. Q. Will, obviously we’re kind of joking about it Friday with the success of the Penske, but to come out strong like this, does it feel good for you guys? WILL POWER: It’s great. It’s pretty impressive for the team to have won in every series, except sports car. I don’t know when they start — they didn’t win, I think sports car is getting dropped now (Laughter). Yeah, they got a chance next week to win, so we’ll see what happens. But yeah, unbelievable when you think about Penske and all the race wins they accumulate, they have accumulated over the 50 years and they continue to do it. Q. A lot of good racing out there today. What is it that you like when you come here and about this course? WILL POWER: It’s a lot of fun. It’s the atmosphere that makes it great. The track is good, but you see the crowd — the crowd on Friday was awesome. It was a great crowd today. Like Scott (Dixon) said, the city embraces it. It’s tough to make street courses work. It’s stood the test of time. Q. Last year you said you felt you were the fastest driver of the season, you had a lot of speed and poles, but you didn’t have the consistency that Scott had and that was important in the championship. If you look at Josef’s stats from last year, he had a pretty good year and surprising he was fifth. Now that he’s started off the season with a victory what does that say for the type of year he may end up having? WILL POWER: I’m sure he’s going to be right there. He always is. You know, just it’s going to come down to consistency. There are so many good guys up front. It seems as though the same guys always end up at the front at the end of the year, just through speed and consistency, understanding how to deal with INDYCAR. There are so many variables in (the NTT) IndyCar (Series) anything can happen. I expect Josef to be there, Scott to be there, Rossi, Hunter-Reay had a pretty bad start, but there’s a lot of people that are fast now. Q. What do you think about Josef’s, under new Reds towards the end, a lot of us thought those weren’t going to last that long but worked out perfectly for him. Do you think you had a chance when he was on those? WILL POWER: It was going to be interesting. I thought he held on pretty well with the used Reds at the start to be honest. He fell back a little bit, but again, towards — none of us ran this race all the way out until the first stint. They actually held on pretty good. I was kind of surprised. The lap times were pretty good. He was the only one which he knew he was going to do. If he started on used Reds — you have to by rule run a new set later on. Yeah, we knew it was going to happen. You know, they had the speed, anyway, so I don’t think it was going to be too big of detriment but as the track was cooling later on and the rubber was gripping up the surface, typically those things should last a bit longer. Q. Sorry if you’ve answered this already, Will, but when Bourdais’ engine blew, you had to go across the grass to get into the pits. Do you think the end result had been different if you had kept on that first stint? WILL POWER: Absolutely. Put me in a way better position — or defense, couldn’t do anything. We had to pit early. These guys had more fuel. There’s just nothing we could do about it. I just was — yeah, and I knew it wouldn’t go yellow because I know that they didn’t go yellow unless it’s a big issue. I knew that that was going to be a stationary yellow. I thought he saw something else. That’s the late call. It was a close call. Maybe it should have kept going, but yeah. Q. I know you’ve got time to be satisfied, soak in today’s race, but looking ahead, a racetrack unlike any other on the circuit, going to COTA, how big a race can that be, and what’s your outlook toward that event? WILL POWER: I’m looking forward to it. It’s such a great track. I really hope it gets a big crowd and people turn up because it’s really probably the best track, best facility and track in the U.S.
Obviously, the U.S. has some fantastic historical tracks like Road America, and every track has its own character, but it’s certainly a great facility for sponsors and a great safe driving track. WILL POWER: I know what you’re saying but to me, it should be about someone deserves to win. Someone shouldn’t win because some random yellow fell at the right time for him. All the money and effort that drivers put in to get into this situation and teams put into development, you should win in a deserving manner. That’s why I think the pits closed thing, that’s the last thing they need to fix in this series for it to be exactly what you say, pure racing. You’re right, they don’t just throw the yellow for anything or debris, it’s not an issue. I think it’s the right direction.